Experience rustic glam from the comfort of your own glamping tentsite. Imagine grabbing a cold champagne from your very own bar fridge and reminiscing about your adventurous day under the sparkle of the fairy lights and stars at your private glamping site. Our glamping tentsite makes these superstar moments achievable. Plan the perfect escape into nature in the most luxurious setting. This tent has been specially crafted with plush animal-print bedding, rustic wooden accent and festival-esque banners. This option is perfect for a glamorous girls weekend, a nature experience for kids, a romantic getaway or just an easy escape for anyone who prefers to not pitch their own tent. 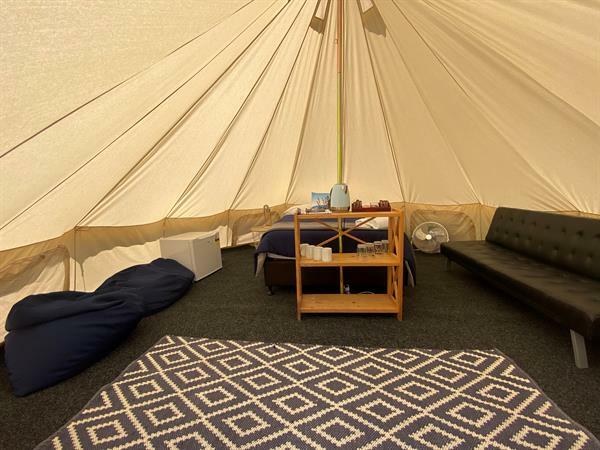 Conveniently located in a quiet area, close by the riverside, our glamping tent accommodates up to 4 people. Fitted with a double-size bed and a sofa bed, a mini fridge, fold-up table and chairs, it has all the ingredients to make your stay look like a fairytale. Prepare a delicious dinner with your private BBQ and your own fire-pit to enjoy a nice drink under the stars or a bedtime story filled with memories and laughs for the little ones. For an extra touch of pampering, our private spa is just a short walk away. Complementary free Wi-Fi is available all around the park to post those family snaps within seconds.